Surrey Orthodontics Limited believes that dental treatments should work with the patient's lifestyle to achieve the favoured result. If you are looking for a treatment option that will straighten your teeth gradually and discreetly, our Invisalign braces in Weybridge will never disappoint. We want our patients to access the most effective and reliable solutions to their dental problems, which is why we offer a full range of services and appliances. Invisalign is among the best options when it comes to correcting misaligned teeth and improving smiles. Depending on the condition of your teeth, our Invisalign dentist in Weybridge will help design a set of clear aligners you will wear throughout the treatment period. Invisalign treatment consists of a series of nearly invisible, removable aligners that are changed every two weeks for the next set of aligners. Each aligner is individually manufactured for your teeth. As you replace each aligner, your teeth will move – little by little, week by week – until they have straightened to the final position prescribed by your Orthodontist. Our Weybridge Invisalign braces are sure to fit your lifestyle. Because the aligners are virtually invisible, you do not have to worry about how they look on your teeth. You can even remove them when you are drinking or eating, or whenever you want to clean them. Made of high quality materials, the aligners work efficiently to achieve the outcome you are after. The type of treatment and the results greatly depend on our knowledge of your dental situation. Visit our practice for an initial consultation; our dentist will see if you are a good candidate for Invisalign treatment in Weybridge. 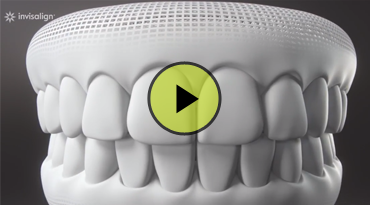 A scan will be taken of your teeth either at your initial appointment or soon after to generate a virtual 3D treatment plan illustrating the series of movements your teeth will go through over the course of the treatment (This is called a Clincheck). This allows you to see what your teeth are expected to look like at the conclusion of treatment and also give you time scales to how long the treatment will take. From the results of the clinical check treatment plan, your custom-made, clear aligners will be produced. Once you are happy to proceed with your treatment, you will need to settle the necessary deposit to manufacture the Invisalign Aligners; the remainder of the fee can be paid over 18 to 24 months by interest free monthly instalments. Check our Fee Guide to view our rates and use our treatment fee calculator to find out how much your monthly payment will be. If you are ready for a smile that transforms your appearance and fits in well with your lifestyle then Invisalign is the answer. Contact us today on 01932 831825 to enquire about our services and to schedule a visit to our practice.